For 2016, Kennywood is completely renovating Noah's Ark and the park is doing an amazing job keeping guests engaged via Facebook, Twitter, and Instagram. A local newspaper ran an article about the restoration. For those who haven't been to the park, or at least not in recent years, the Ark has been neglected and somewhat of an embarrassment. Most of the stunts didn't work, including the final stunt--leaving the ending very lackluster. The animals were falling apart, not moving, and the whole attraction was just depressing. The park is listening to guests who have repeatedly begged for the return of the famous whale's mouth entrance. This will replace the elevator stunt. Actually, all the stunts except the shaker boards and high seas (spinning barrel) room are being replaced. No, the park isn't getting a new ride for 2016 but I think many Pittsburghers will be very happy to see the Ark return to its former glory--more of a funhouse than a scary walk through. It'll be nice to see this walk-through in something akin to its old splendor. Can anyone explain exactly how the elevator trick worked? Does anyone have any pictures or illustrations? I think I caught a glimpse of it being a turntable about ten years ago, but the photos of when they were removing it do not support that idea. Hydraulics quickly lift you gently up then forcefully down over and over while the rolls of "rock" in the windows scroll in sync to make it seem like you're falling. You turn 90 degrees to the left and exit a few inches higher than where you entered. Yep. Years ago, ACE's late Gary Baker treated me to a day at Kennywood, including a behind the scenes tour of Noah's Ark. That's how the effect worked. If anybody would know, it's JB. Thanks. I assumed that I knew how the illusion of dropping was done. I thought that I knew for sure that it was on a turntable, but I forgot if I knew for sure, if that makes any sense. The photos that were posted somewhere online showing the removal of the elevator made me doubt that it was a turntable. I expected to see the elevator sitting on some kind of disc, but did not. When I went to Kennywood 2 years ago I really enjoyed walking through Noah's Ark (I ended up liking the entire park more than I was expecting to). I later found out some of the effects were no longer working but didn't miss them at the time since I didn't know about them. It's nice to hear it is being restored. 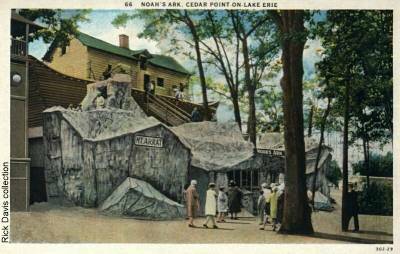 Cedar Point used to have a Noah's Ark (many parks did, back in the day). One of the many, many things I like about Kennywood is that they devote resources to preserving what are now rare rides and attractions. I always make sure to ride Garfield's Nightmare, not out of any love for that inane cat, but to enjoy the Old Mill experience. I was at Kennywood a couple years ago and I'm almost positive I walked through Noah's Ark. Hate to say this, but I don't remember it. My last visit was two years ago and was disappointed to find a lot of stuff not working. I can see how it would be totally forgettable if you'd never previously experienced it in its complete form.